With improved performance making the web more accessible and email even quicker, the iPhone 3G S is up to 2 x faster and incorporates Video recording, a 3.2MP Camera, Voice control and a digital compass to compliment maps and help get directions. Also available in 8GB, White and 32GB. SPECIAL OFFER: UK customers can add a 3 months free insurance gift certificate with this SIM Free phone. 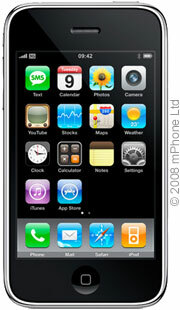 The Apple iPhone 3Gs is Software Upgradable, Completely SIM Free and will work on all UK networks including O2, Vodafone, Orange, T-Mobile and Three.